A random Haruka Shimotsuki album popped up on soopah seekret moosik society that I really needed to lurk moar on so I thought “Hey, why not do a review?” So…here I am. The album starts off with an instrumental track. 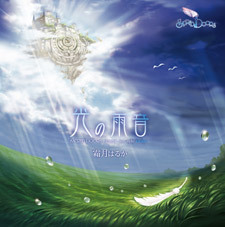 It’s pretty nice, a light piano that leads into wind instruments, bringing that dreamy majestic feel fantasy albums (like Shikata’s and Katakiri’s) are known to bring about. The second vocal track is much quieter than the last one. It’s a very calming track that features a violin in the backtrack. For the most part, it’s Shimotsuki’s vocals that carries this track through to the end. That, and the violin. It’s the type of song that soothes the soul…or some other kind of thing like that.